As you are aware, the Board of Directors approved our Policy on Concussion Procedure and Protocol last Fall. It is aimed at educating and protecting our young athletes from the effects of traumatic brain injury. Concussions are brain injuries and have been largely mistreated and misdiagnosed for many years. We have adopted the Pennsylvania Safety in Youth Sports Act, signed into law in 2011, to help us address this issue. 1. Educating and certifying all of your coaches, annually. 2. Educating all of your parents and children participating in your programs, annually. 3. Complying with return to play protocol as set forth in the policy, always. 4. Annual certification of compliance. Compliance is your responsibility. Each year, an officer of your organization will certify that you are in compliance. We have created a simple form that will be signed by an officer (as per your annual RG-1) and returned to the state office in October of each year. In short, we all must enforce coaching education and training; parent and child education and proper return to play protocol. What is critical is that each layer of our membership is aware of the symptoms and effects of brain injury. We are each other’s checks and balances to ensure first and foremost, the safety of the player. Second, we are aiming to protect our coaches, parents and players from placing competition above health. The policy, as well as many resources to assist you, is available through our website. If you need further guidance, please contact the state office any time. I’m also pleased to announce that we are hosting the Children, Sports and Concussions Symposium on Monday, April 22 at the Philadelphia West Marriott in West Conshohocken. The program begins at 7 p.m. and features former MLS and US National star Taylor Twellman; former Philadelphia Flyers captain Keith Primeau; pediatric concussion specialist from Children’s Hospital of Philadelphia, Dr. Matthew Grady; Lacrosse Hall of Fame goalkeeper and college coach, Brian Dougherty; and our own Director of Coaching Mike Barr. PA Senator Pat Browne, the co-sponsor of Act 101 will also be in attendance and provide remarks. This event is free and open to all parents, children, coaches, administrators, educators and health care professionals. For more information and to register for the event, please log on to EPYSA.org. EPSARC is the Eastern Pennsylvania Soccer Association Referee Committee. Under the authority of U.S. Soccer, EPSARC governs over referee administration, including registration, assessment and education. The committee is co-chaired by a representative of both Eastern Pennsylvania Youth Soccer and the Eastern Pennsylvania Soccer Association. Currently the committee is chaired by both sitting presidents of our two associations. Beginning in 2010, a policy was approved whereby referee fees would be established using government established economic indicators, the Consumer Price Index and the Mid-Atlantic CPI for Gasoline. First, thank you for the patience and understanding necessary as this unique period in US Soccer takes shape. As I’ve spoken to many clubs and leagues over the past six months, this is an historic undertaking for US Soccer. This is the first time such broad changes have been introduced by our governing body. We have collectively been in a holding pattern while waiting for requested updates and alterations from US Soccer. Issues regarding the new mandates were being addressed at a national level by US Youth Soccer in concert with other national youth organizations. Our initial expectation was that we would have some response in January, and then by the US Soccer AGM which was held last weekend. Although I can assure you the discussions are taking place, and US Soccer is listening, the answers we would like to give to you have not been settled on. The staff and I have been involved in the conversations and have advocated for our members, and others, to move forward at a quicker pace. We are acutely aware of our local calendar and processes, but they are not in the same order as the national priorities. Along with several other state associations, we have decided it is necessary to move forward. 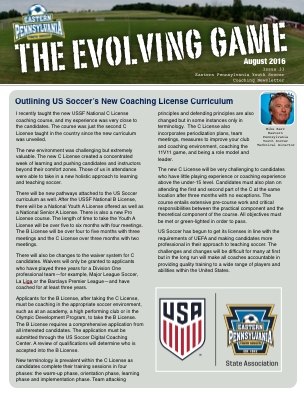 We have developed local modifications for small-sided games, based on the US Soccer Player Development Initiatives and the previous US Youth Soccer recommendations, as well as conversations directly with those entities. We are still vetting the rules changes, including the adoption of the new heading rules and protocols and field-size ranges. We will provide that very soon. For today, the primary concern is the roster size. We feel it’s absolutely necessary to allow you to prepare for tryouts this spring with no further hesitation. Under 8 is developmental and primarily recreation and intramural. All players are required 50% playing time. At Under 10 and Under 12, our recommendation on the lower number is twofold: 1) It is regarded as the lowest number of players that is being proposed and 2) The reasoning is that it would promote more playing time for the children. The other consideration is to double the number of players on the field. Also logical, but as we do not know which will be the final choice, the lower number is prudent at this time. The other state associations that make up our region are all working similarly, but there may be variations from one state to the next. Ultimately we will have a national standard. As promised, US Soccer has finally released the new ranges for small sided games field sizes and roster sizes. The Youth Members Technical Committee, which is comprised of the technical directors and administrative representatives of all of the national youth associations recommended these changes from the original program as proposed by US Soccer. As expected, the field sizes have been enlarged. Similar to the rules for full sized fields, you will now have a range for width and the length of your fields. Roster size has been a primary concern and I can assure you that dating back to 2015, Eastern Pennsylvania and several other state associations emphasized that setting the roster size should be the priority due to sprig tryouts. In the interests of our membership, Eastern Pennsylvania moved forward with the decision on roster sizes based on the best information we were able to obtain from the Technical Committee and US Soccer. Therefore, as we were offered a range of responses, we offered a recommended size and a maximum size. As of yesterday, we now have the standards. The standards are more closely in line with the recommended roster size, but less than the maximum roster size we made available to you. For the 2016-17 season the roster sizes we committed to will be allowable for league play for those teams that have made their final roster decisions. For any teams that have not, we would strongly recommend adopting the standard roster size immediately. How this will affect the National Championship Series or Presidents Cup is to be determined. As far as how it may affect tournaments, we recommend Eastern Pennsylvania sanctioned tournaments provide for flexibility. We appreciate everyone’s cooperation and understanding. Below is an updated table of the field sizes and corresponding roster sizes for small-sided games. These standards were finalized based on the input from the Youth Members Technical Leadership Group and feedback provided by Directors of Coaching. It's crazy to think the top European leagues are returning to action in the next few weeks. It feels like the season just ended, especially with the Copa America Centenario and Euro's taking place this summer as well. Of course, many of you are already prepping for the new season after a long road into the summer. Congratulations are due to the North Union United Wave for winning the U14 Girls US Youth Soccer National Presidents Cup and to John Greaves and YMS Premier Xplosion, who recently won the U17 Girls National Championship after their fourth consecutive trip to the final. Well done to both. We'd also like to ask for a favor. In partnership with the Army-Navy Cup Committee, Eastern Pennsylvania Youth Soccer is seeking nominations for the inaugural 1st. Lt. Travis Manion & Cpl. Michael Crescenz Award. The award will be presented at the Army-Navy Cup on September 23 to two high school students, one boy and one girl, who live by the motto, "If Not Me Then Who..." Information and nomination forms can be found at EPYSA.org. Thank you for reading and please share the wealth! Eastern Pennsylvania Youth Soccer has been fielding several questions recently in regards to the build out line in 7v7, small-sided game play. 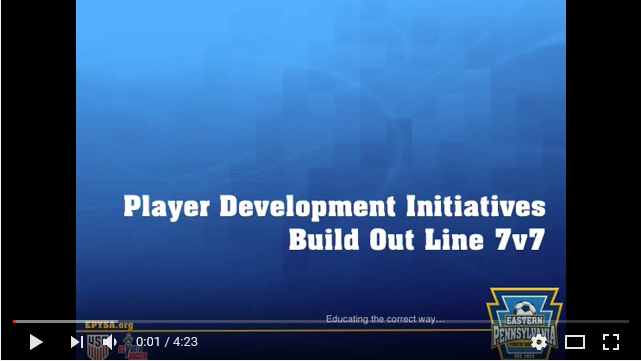 To help alleviate any confusion, we've put together the following video to explain the build out line, the philosophy behind it and the rules that are now included in small-sided play. The below video is Part I of a series. Look for more videos in the coming weeks. In case you missed it, we also put out a video explaining the new heading rules earlier this week with the help of the Eastern Pennsylvania Soccer Association Referee Committee. 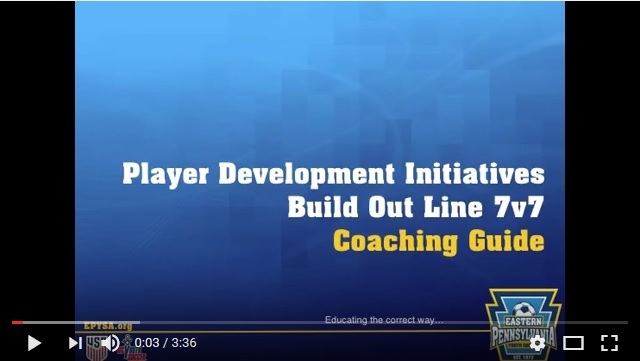 To help alleviate any confusion, we're putting together a video series to explain the build out line, the philosophy behind it and the rules that are now included in small-sided play. The below video is Part II, where our Technical Staff explains the coaching principles now associated with 7v7 play. 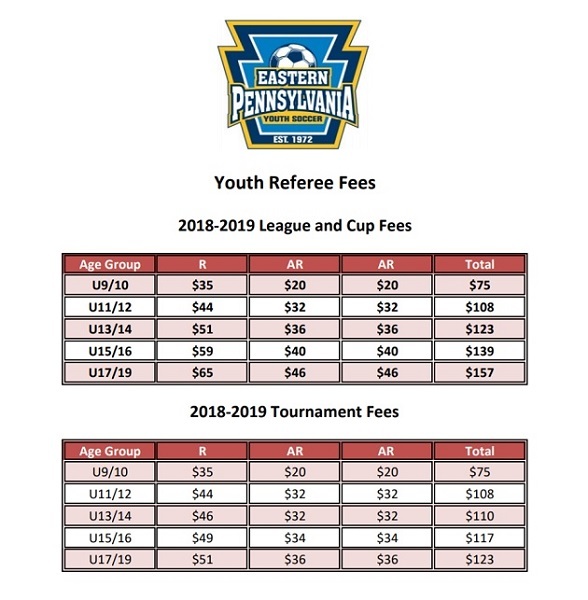 In case you missed it, we also put out a video explaining the new heading rules last week with the help of the Eastern Pennsylvania Soccer Association Referee Committee. As we prepare for the 2017-18 seasonal year, I wanted to share step-by-step instructions of the initial registration process. Each step is linked in the title. Steps one through four must be completed by July 1. The above link walks you through the steps needed to complete registration. You must have all applicable organizational contacts complete this process so they can be included in your Annual Membership Form. Formerly known as the “RG1”. This form in the basic information for your organization. The information you provide in this document will be used during the year by our office to better serve your organization. This section will allow you to select what age groups you offer within your organization. You must have all of your coaches complete this process. If they do not do so, they cannot be placed on team rosters. You may also access your 2017 – 2018 Status Report. This will allow you to track your organization’s progress with the new seasonal year’s registration process. Please note, Step #1 through Step #4 must be complete by July 1st, 2017. All of the above as well as specific resources for Travel and Rec Leagues and Intramural Members is available on the Membership Services section of our website.